This consumer guide describes how to improve a home’s energy efficiency and indoor environmental quality, which can help reduce heating and cooling costs, save energy, and improve occupants’ health and comfort levels. Adopting energy-efficiency measures can also reduce both a home’s carbon footprint and the nation’s overall greenhouse gas emissions. This guide summarizes how homeowners and renters can make their homes energy efficient and healthy. It provides links to websites, including those of federal agencies such as the U.S. Department of Energy (DOE) and the U.S. Environmental Protection Agency (EPA), for more detailed information on the different topics. The information in this guide can be applied to both new construction and renovations. Although renters may be reluctant to undertake the more expensive energy-efficiency improvements discussed in this guide, this information can still help them discuss energy-efficiency measures with their landlords. This guide, however, does not cover systems needed for large multifamily buildings; information about such systems can be found at some of the websites cited in this guide. Energy use depends on a home’s age, location, housing type, and construction. 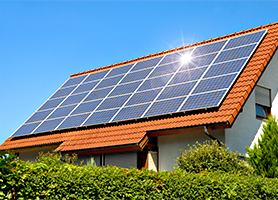 The U.S. Energy Information Administration’s most recent Residential Energy Consumption Survey indicates that, on average, U.S. homes built in 2000 and later consume only two percent more energy than homes built prior to 2000 despite being 30 percent larger, indicating improved building shells and increased energy efficiency of new heating and cooling systems, appliances, and electronics. A home’s location determines which climatic zone it is located in, and climate has a significant effect on a home’s energy use. For instance, homes in hot climates, both dry and humid, benefit from having light-colored roofs and reflective insulation (which reduce radiant heat gain), but homes in cold and very cold climates do not. DOE's Building America program has prepared guides that provide information on improving the energy performance of new and existing homes in the five main climate regions in the United States. In addition, a home’s location relative to that of jobs, shopping, schools, and other significant destinations affects the household’s overall energy consumption. By directly affecting transportation, the second largest item in a typical household’s budget, home location also has significant financial consequences. People living in compact, walkable neighborhoods located near transit systems are likely to drive less, consuming less energy for transportation. Energy consumption also depends on housing type. For example, energy use of single-family detached homes varies substantially from that of multifamily homes. Data from the 2005 Residential Energy Consumption Survey shows that an average multifamily unit uses half the energy of an average single family detached home. Units in multifamily buildings tend to require less heating and cooling because they are smaller and share walls with adjacent heated and cooled units. Many aspects of a home’s design, construction, operation, and maintenance also affect its energy use and the health and comfort of its occupants. Energy-efficient, green building materials with low embodied energy can reduce environmental impacts. In addition, knowledge of issues such as airflow, heat flow, and moisture flow in a home can help consumers better understand how to reduce energy loss and improve a home’s energy performance. EPA’s “Building Science Introduction” explains the causes, control measures, and effects of airflow, heat flow, and moisture flow in a home. DOE’s website also offers resources for information on building science. According to DOE’s analysis of 2010 data, the largest sources of energy consumption in a home are space heating (accounting for 45% of the energy consumed in U.S. homes) and water heating (18%), followed by space cooling, electronics, lighting, and miscellaneous uses (37%). DOE estimates that energy-efficiency improvements could reduce these energy costs by 5 to 30 percent. As a first step toward improving a home’s energy efficiency and indoor air quality, consumers should consider starting with an assessment of their home’s energy use and indoor air quality; more information on this topic is provided in this website’s “Home Energy and Health Assessments” section. The “Energy Efficiency and Indoor Air Quality” section provides information on strategies to reduce energy costs and indoor air pollutants in homes. Moreover, this website’s “Financial Incentives for Home Energy-Efficiency Improvements” section provides information on tax credits, rebates, and other incentives that federal and state agencies offer for home energy-efficiency improvements.